MAS National and Lighthouse Youth Projects have been successfully contracted by the Federal Department of Employment to deliver the Empowering Youth Innovation Initiative, to disadvantaged youth in Adelaide’s Northern suburbs, supporting them into continued learning and employment pathways. 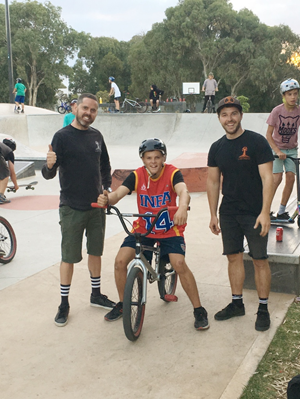 The Cycle of Change program combines vocational and non-vocational workshops, with BMX riding, to assist participants in the development of hard & soft skills and knowledge, successfully preparing them for life transitions. We have been working with MAS National’s amazing staff to deliver multiple workshops supporting participants in developing the knowledge and skills to address barriers to employment. Integrating the learning of these new skills into BMX riding, the BMX’s act as a vehicle of engagement, promoting social inclusion and peer support, and allowing the contextualisation of knowledge gained through the workshops, encouraging authentic and meaningful relationships, projects and experiences. Seeing the kids progress from the BMX track to the workforce is a feeling that we don’t think will get old anytime soon! DK Bikes Australia is a proud sponsor of Lighthouse Youth Project Inc. Words by Jamie Moore and Ryan Lloyd, Lighthouse Youth Project Inc. co founders. DK Bikes & Advance Traders help out Will with a new bike!